I was reminded today that not everyone owns a Kindle or other ereader device and that some people still prefer a real live touchable paperback or hardback book (you know, one you can hug to your heart or spill coffee on - or both!). 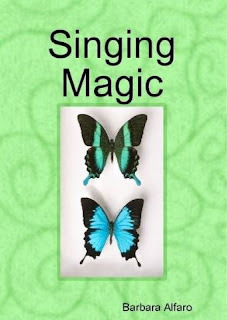 For those people who also like poetry, here is the paperback edition of my poems called Singing Magic. It's available on Amazon and as it is the very first book I self-published it is definitely my "favorite child."